We have had the pleasure to get an interview with one of the biggest favourites of Melodifestivalen 2019: Jon Henrik Fjällgren! As Jon is a man with deep thoughts and emotions, this interview will give you an insight in his inner world that he’s so beautifully sharing as well. Both when it comes to his music and his roots. Congratulations on making it into Melodifestivalen for the third time, Jon Henrik! First of all, to get to know you better and you being an intuitive person: could you tell us what emotions drive you in your musical career and in your life in general? I don’t define me with any specific emotion, as a human we have all different emotions depending on the day. In my music, it is always real what you feel when you listen to it, either if it is sadness, joy or whatever the feeling is that I want to communicate. 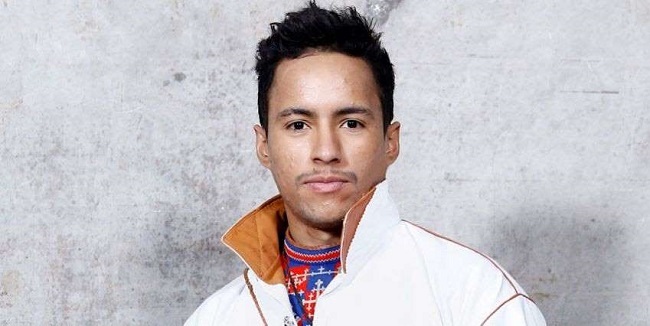 Jon Henrik Fjällgren became a familiar face in Sweden when he won Talang 2014 where he performed ‘Daniels Jojk’, an ode to his best friend Daniel who died from diabetes. You had your breakthrough in Talang 2014 (red. : Sweden’s Got Talent) where you sang ‘Daniels Jojk‘, your self-composed joik for your dear friend who passed away. You won Talang 2014 and have achieved the same thing in Saepmie Welcomes Festival (a Sami culture festival) and Let’s Dance 2018. What did those experiences mean to you and moreso: to even win those competitions? For me it is just about getting new experience in life. To learn more about yourself and your own ability’s. But of course, it is always nice when people like what you do and the feeling of winning something. You have participated in Melodifestivalen twice before: in 2015 with ‘Jag är fri (Manne leam frijje)‘ (Translation: I Am Free) and in 2017 again with ‘En värld full av strider (Eatneme gusnie jeenh dåaroeh)‘ (Translated: A World Full of Battles) doing incredibly well: finishing second and third respectively. What can you share with us about those experiences? A fruitful collaboration in 2017, when Jon Henrik and Aninia brought ‘En värld full av strider’ to the final of Melodifestivalen and finished 3rd there! My first song was called, if you translate it into English: I am free. That is pretty much what the song is about. To leave the old troubles behind and start on a fresh new page. The second time around it was great working with Aninia, we had much fun along the way with many laughs. The things that was different this time was that I knew a bit more what I was entering with the competition and everything around it. And now you’re back into Melodifestivalen for the third time! What made you decide to come back and can you tell us how the journey towards this new participation went? The new song came to me through a dream, I have a good feeling about it! It’s about when you get caught up in a bad pattern and you finally get out of it and you start seeing the good things in life and you find the light. If you end up doing even better this time and win Melodifestivalen: what is the goal for the Eurovision Song Contest? It is a good window to show a bigger audience my music. The Jojk is a way of singing that lays very close to my heart. It can help you many times do deal with emotions that you carry inside. And to learn or show people this, I see that as a great honor! Your roots lie in Cali, Colombia, where you born, have lived in a Native Colombian village, later on moved to an orphanage and were adopted by a Swedish Sami family. Can you tell us how the trip you made to Colombia years later went and what it meant to you? Jon Henrik’s ”Colombia” tattoo, which has a lot of meaning to him. It was a great country, in a strange way it felt like home when we first landed there. I liked the people, they were all very nice to me. And for once I felt a bit tall, it doesn’t happen so many times when I travel in Europe, haha. The weather was nice too, not to cold and not too warm. I would love to go to Colombia again, and maybe stay a bit longer, I was only there for a few days when went we went the last time. The tattoo (Red. : ”Colombia” on his chest) is a reminder of my roots, to be proud over who you are and where you’re come from. Then finally, do you have a message to our readers of ESCBubble? I don’t have any particular message but I hope I can inspire more people to listen to my music, and that they will find my new song “Norrsken” as good as I do. But above all take care of the once you love and always be nice to each other! Thanks a lot for this interview, Jon Henrik and good luck in Melodifestivalen! Jon Henrik will be competing in the third heat of Melodifestivalen, this Saturday the 16th of February, where he will be the final performer of the night (#7) with his song ‘Norrsken‘!